The Plasdŵr illustrative Masterplan and Design and Access Statement give more detail on the vision and the plan. The Design and Access Statement gives a lot of detail on the proposals for Plasdŵr. As it is very large, the various sections are introduced and can be downloaded individually below, incorporating illustrative maps and plans of the area. This is the most detailed document showing what is proposed for Plasdŵr. Its various sections are introduced and can be downloaded below, incorporating illustrative maps and plans of the area. Here the vision for Plasdŵr and the movement, environment and character objectives are detailed. This section also explains the location of the proposed site for Plasdŵr in the context of its neighbouring communities and accessibility. It puts the development into the context of the City of Cardiff’s Local Development Plan (LDP) and regional development policy. It also contextualises the first two applications for 920 homes within the Plasdŵr Masterplan. This section details the site’s landscape and topography, heritage and ecology, looks at the constraints and opportunities it presents, and sets it in the physical, social and planning contexts. This section explains how considerable importance has been placed on a high standard of design, from layout to architecture. 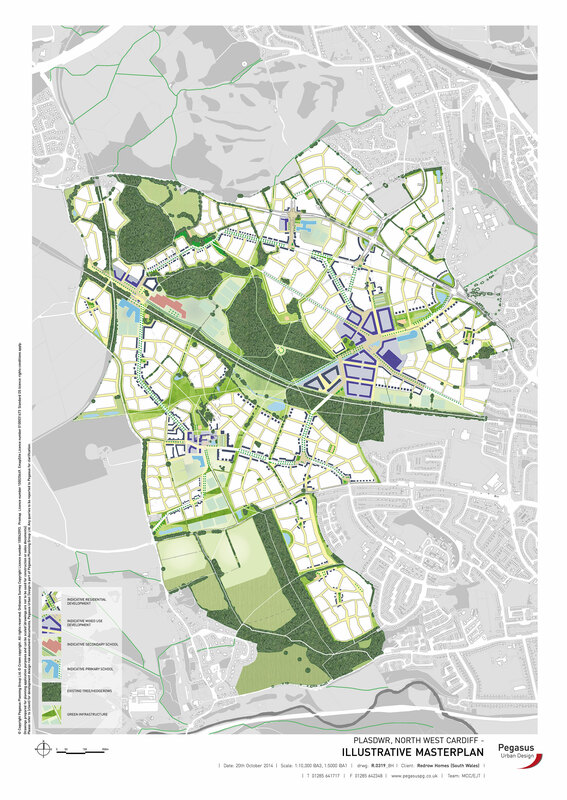 It outlines how the City of Cardiff Council’s ten masterplanning general principles have informed the site’s proposed design, including sustainable travel; development density; neighbourhood centres; high quality design and character; integration with neighbouring areas; landscape; biodiversity; heritage and efficient use of resources. This section is where you will find a lot of detail on what Plasdŵr will look like and how it has been planned in order to truly become a ‘place’. It includes lots of images and plans. It shows all the design proposals, including the uses, amount and distribution of areas proposed across residential, mixed use, employment, education and public open space. Access arrangements, including the overall transport strategy are also outlined here, as well as the layout of the development and the street system, the scale of buildings and landscaping. Details of how Plasdŵr will connect to existing, bordering infrastructure and communities are explained here, including proposed road junctions. This section details the 11 identified ‘character areas’ within Plasdŵr which will ensure it is a unique, distinctive and memorable place. These have evolved naturally through the design process and will provide architectural and design cues. All areas of sustainability, from environmental to inclusive design, are also detailed here. Phase 1: Llantrisant Road Reserved Matters Application (September 2016) – gives detail on the layout and composition of the first 126 homes.